This weekend I took the advice of one of our writers Lorne as well as millions of other viewers that said Big Hero 6 was a must see movie. I must say they weren't wrong and this was a really good movie that I regret not seeing it in theaters. Hiro develops a special bond with Baymax, a personal healthcare consultant his brother invented, after his brother passes away tragically. Hiro, Baymax and a group of friends look to get to the bottom of the mystery, who stole Hiro's invention. With different misdirections throughout the movie to make you ponder then know for certain who the bad guy is makes for a very entertaining movie. I wish I was smart enough to turn both myself and my friends into superheroes... Oh well. Back to the movie, Disney did an awesome job with creating a character that everyone loves both young and old. I found myself attached to Baymax, this was very evident by the end of the movie. There is a good moral dilemma tracing back to the death or Hiro's brother. Then of course a bit or a tear jerking moment followed by a happy ending. This recipe always makes for a great movie! Highly recommend watching this movie and for a household of youngsters its pretty much a given that you need to watch this, if you haven't already. 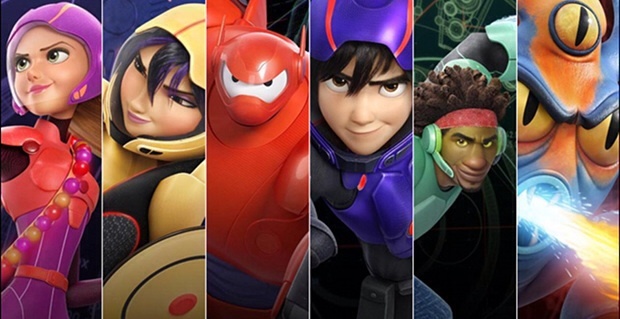 Pick up your big hero 6 figures now!